GRAIN growers could stand to benefit from promising Western Australian research into a cost-effective seed coating technology with potential to boost cereal crop germination rates in water repellent soils. Recent results from a trial with Grains Research and Development Corporation (GRDC) and Western Australian State Government investments found that seed coating with wetters provided higher agronomic efficiency than using the current method of placing wetters on top of, or in, the furrow. 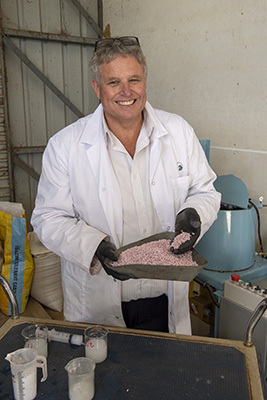 Department of Primary Industries and Regional Development (DPIRD) development officer Geoff Anderson said the seed coating contained a surfactant that reduced the surface tension of the water and could improve germination by improving wetting of the seeding zone. “Seed coatings with wetters applied at 0.065–0.325 litres per hectare achieved similar increases in plant density, tiller number, biomass and nutrient uptake as wetters applied to the furrow at 1–5 litres/hectare,” he said. “The large responses in crop establishment, early growth and nutrient uptake observed in these experiments were due to the very dry May-June seasonal conditions and also because the experiments were sown dry. At the trial site at Darkan, Dr Anderson said the seed coated with soil wetter produced 34 per cent higher plant densities on average than the control with no treatment. He said, in comparison, both of the soil-applied banded soil wetter treatments – in-furrow and on top of the furrow – averaged 47pc higher plant densities than the control plots, but these used much higher rates of wetters (at 1-5 L/ha) than the seed coating treatments and were therefore less cost effective. At the Darkan site, in-furrow placement of wetters gave a 9pc grain yield response. Wetter coated to the seed at 4.0 L/t, and the wetter on top of furrow at 5L/ha also increased barley grain yield by 9pc. At Badgingarra, the commercial soil-applied wetting agents also led to the highest plant growth, measured by tiller number. The soil wetter, banded at 5L/ha on the top of the furrow, produced plants with the highest number of tillers (at 101 tillers/square metre), which was 130pc higher than the control (44 tillers/m2). The treatment with seed wetter coated on the seed resulted in only slightly fewer tillers (between 70 and 92 tillers/m2), representing an increase in tiller numbers of more than 100pc compared to the control. Higher tiller numbers carried through to higher biomass, with soil wetters applied at rates of 2-5L/ha placed on top of the furrow producing a biomass of about 3 tonnes of dry matter per hectare – or a 94pc increase in DM/ha compared to the control. Seed coated with a soil wetter product had the next highest biomass of 2.5t DM/ha – an increase of 65pc compared to the control. Final yield data was not collected at the Badgingarra experiment due to severe bird damage. Coating wetter onto the seeds also has the potential to increase handling efficiency, according to Dr Anderson. “Further investigation will take place this year into methods to coat seed with wetter on-farm using existing processes to make the technology even more cost effective,” he said. Research and economic analysis is continuing in 2018 with five trials. Three trials will look at different coating techniques for wheat, barley and canola while two trials will assess the interaction between seed coating and nutrient uptake. Coating seeds with wetters to improve crop establishment is a new field of research and more work is needed to gain a more accurate picture of crop establishment and yield benefits. However, previous experiments have observed that wetters applied to furrows have increased plant density by 10–70pc with an associated increase in grain yield of 0–29pc. It is expected similar benefits could be gained from seed coating.